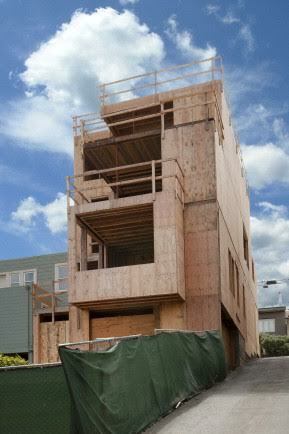 4546 19th St., San Francisco CA 94114 – Rare opportunity: mid-construction project, approved as a 2-unit building. Sweeping views of downtown, SF Bay, and beyond. Corner site with abundant light, detached on 3 sides, on a deep lot. Plans call for 4696 sq ft of living space (per architectural drawings) configured for: 4+BR, 4.5BA, 2 kitchens, 3 laundries, 2 living rooms, FDR, entry, den, office, workshop, and three storage rooms. Magnificent full-floor master suite includes a den, huge bath, and laundry! Indoor/outdoor living on all levels, with sliding pocket door systems connecting to 3 terraces, 2 patios, and protected courtyard. Garage parking off the private alley for 4 cars. Elevator to all five levels. This home’s going to have it all: design, location, space, options, upside, and views!